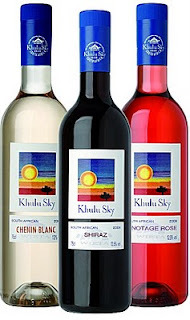 Khulu Sky is a new range of three South African wines from Roger Harris Wines which include a Pinotage Rosé. Khulu means ‘wonderful’ in Zulu. The bottles don’t look different although place them next to another wine and they are not as tall. That is because these bottles are plastic, not glass. Plastic bottles have many advantages being light, unbreakable and allowed in events where glass is banned, but there have been issues in the past about longevity where wine is concerned, which I raised. I was assured that these bottles are made from a new type of plastic guaranteed for two years. (see below*). The range is promoted on environmental advantages. The wine is shipped in bulk to Macon, France where it is bottled, thus saving the weight of shipping bottles across seas. The lightweight bottle reduces the carbon footprint in transportation and distribution, fewer carbon emissions are produced than in manufacture of glass, and the entire bottle can be recycled. The wines are produced under WIETA (Wine Industry Ethical Association) certification, a non-profit, voluntary association committed to the promotion of ethical trade. The WIETA logo appears on both the front and back labels. I put Khulu Sky Pinotage Rose 2009 (WO Western Cape 12.5%abv) to two tests: is the bottle unbreakable and how tasty are the contents. So it passed the first test with flying colours. The bottle has a decent long plastic screw cap so I resealed it and took it back upstairs to the apartment. You noted my surprise on my first taste, shown in the video, on how dry it was. I poured glasses for cameraman Dan and my partner. It was a hot day and the chilled rosé should have been most welcome, but I found it increasingly unpleasantly sour. The other two would take no more than one mouthful. Hopefully this was a faulty sample because I can't recommend it on this sample. Marketing of these wines focus on ecology and ethical trade but I wonder whether unemployed South Africans think it is ethical that jobs on bottling lines and at bottle manufacturing plants have been exported to well paid French workers. "You are right in saying there have been some issues with standard PET and oxidisation of wine causing problems for some retailers. The multi-layer bottle (MLP) that Paul Sapin has developed has a purely mechanical barrier made up of two layers of Polyethyelene Terephthalate with a barrier material made of nylon mixed with an oxygen scavenger. The entire bottling process is geared towards eliminating oxygen, incorporating state of the art technology and meticulous attention to detail. An independent laboratory carried out accelerated ageing tests on wine bottled in the MLP and glass under the same conditions. All parameters measured showed no significant differences between the MLP bottle and glass bottle. These observations were confirmed by blind tasting, conducted by a panel made up of winemakers, professional and amateur tasters. At no point was it possible for the tasters to find a difference between the wines. As a result, Paul Sapin guarantees a conservation period of one year for wines in 18.7cl MLP PET and two years for wines in 75cl MLP PET. " I absolutely adore reading your blog posts, the variety of writing is smashing.This blog as usual was educational, I have had to bookmark your site and subscribe to your feed in ifeed. Your theme looks lovely.Thanks for sharing. Videos: Altydgedacht Estate cellar and vineyards.